The “Fighting Pistol” is comprehensive 1-Day course for the professional armed civilian, Law Enforcement or Military. This course will concentrate on refining the handgun fundamentals and the ability to apply them in compressed time frames, consistent to real world engagements. Incorporated in this course are tactical movement, shooting at increased distances, conventional and unconventional shooting positions, the proper use of cover, addressing multiple threats and shooting from close contact/weapon retention. 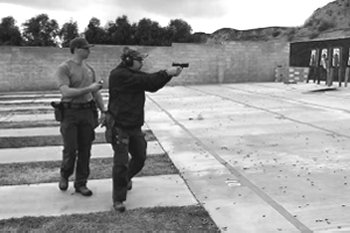 The class is taught by experienced California POST certified law enforcement firearms trainers, Marc Fleischmann and Clint Achziger. Both instructors have decades of experience providing tactical firearms training to civilians, law enforcement and military personnel. Don’t miss this opportunity to train with the best! Formal training on a self-loading semi-automatic handgun from a recognized civilian firearms school, basic law enforcement handgun training, basic military handgun training. (Familiarization Training or Fam Fire) will not meet the prerequisite training requirement. This is not an entry level course.